Sink Your Teeth In – For FREE! Nothing says “Happy New Year” like something you get for FREE! 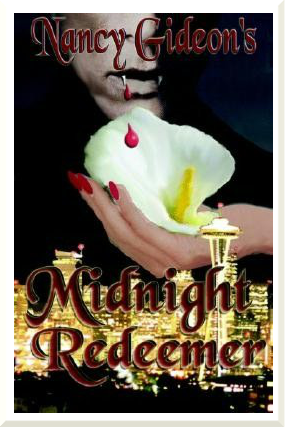 From now until December 31, MIDNIGHT REDEEMER from my Midnight vampire romance series is available for Kindle . . . for FREE! I had such a great time researching this book (not with the neck nibbling, but with the traveling to Seattle! ), and loved secondary human character, the professionally ambiguous Frank Cobb, so much I gave him his own book with MIDNIGHT SHADOWS. I’m really excited by this FREE offer to introduce readers to the dark, dangerous, and delicious “Romance with a Bite!” Midnight world. What are you waiting for? Head over to Amazon for your FREE download. Great News to Fill Your Stockings! Santa came early to leave these exciting tidbits for you! Seeker of Shadows (click image to see larger version) will be released on May 29, 2012! So you’ll get your BY MOONLIGHT fix a whole month earlier! And . . .
There’s more BY MOONLIGHT to come! Pocket just purchased two more books in the BY MOONLIGHT series! No deets yet, but the first just might be out in 2012! It’s intimidating. It’s scary. If you don’t have a publisher who’ll set one up for you, it looks like a tremendous amount of work. Wrong on all counts. Setting up stops on active writing sites and blogs to coincide with the release of your book is a huge, FREE way to get your name out to readers. All it takes it some preplanning and a few e-mails. Since I’m ADD, I love lists, so I’ve given you a few to follow for booking your first (or fifteenth!) blog tour. What sites have reviewed books similar to yours? Google Paranormal or Romantic Suspense Review Blogs, etc. Then browse, making notes on the site URL and what it offers for later reference. Where have other authors in your genre gone? Check their websites and PR materials for pull quotes. Who has favorably reviewed other books from your publisher? Ask them or look on their book jackets and inside covers. What areas of interest does your book touch on? Dog breeding? Ancient weapons? Child rearing? Don’t be afraid to tap into those sites for some cross-over promo! Who do you know that has a blog? Reach out to friends for support. Check out the tone of the site—author-friendly or snarky? Professional looking or slapped together? Do they create an inviting look by featuring author photo, book covers, blurbs, etc.? How many readers go to their site? Check visitor counter, number of networked blogs, Google friends, etc. Check their calendar to see how busy they are and how far ahead they’re booked. You have to approach some sites up to 4-6 MONTHS in advance to secure a date. Do people respond to their posts? Check the comment section. What does the site offer? Read their For Authors section for requirements. Do they offer other options such as Interviews? Is there a cost? Do they hype their guests? Check Facebook and Twitter posts. Are you preaching to the choir? Make sure all your posts aren’t to the same group of people. You want to bring in new readers, not annoy the same small cliché with a saturating blitzkrieg or PR. They look professional, have lots of reader traffic and author/reader interaction. Check their Contact page and e-mail a request. Just do it! Provide your name, publisher, title, genre, release date and an URL where they can learn more about you (ie website, blog, Amazon page, or publisher site) and ask if they’d be willing to help you promote your book with an interview, a review or just a release announcement. Easy peasy. Nothing to get nervous about. Either they’ll say yes or no or that they have nothing available in that time frame (if they don’t, ask about your NEXT release date. Booking ahead is a good thing!). Be brief, polite, and to the point and don’t be discouraged if you get no response. Sometimes e-mails go to spam files or are lost, so don’t take it personally. Keep a record of who you contacted, the date, and the response for later reference. An author photo of professional quality. Your book cover in a good resolution but not toooo big of a file. A short bio with just the facts: name, writing history, a fun factoid and links to where the reader can learn more. CONTENT! Here’s the biggy. What are you offering the blog host? Vary your content! Don’t send the same canned responses to every site. Try to make EVERY post unique so that even if the reader has read one, they’ll be finding out new information each time. I know this is time consuming but it is well worth the effort. Offer an excerpt. Readers love to sample your voice. DON’T send the same excerpt out each time or use the one posted on your website. Keep it short, just a scene that’s active, captures the feel of your style and the characters, and keep it CLEAN, unless the site provides a content warning. Ask the blog host for a Q&A interview. Don’t give the same stock answers. Keep it fresh. Try something different! Some sites offer blog radio interviews or chats. Don’t be afraid to step outside your comfort zone. Talk on a topic concerning your writing process, the characters, setting, or genre of your book. Make it fun and personal (but not TOO personal! I shy away from putting up photos and detailed information concerning my family.) or educational, so the reader feels a connect with you. Give away teasers about the book, but not ‘SPOILERS’ unless you mark them clearly. Some readers don’t want to know ahead of time. Offer a giveaway. Readers love free stuff! A copy of your book is the easiest (check with your publisher to see if they’ll provide the book!) but Romance Trading Cards, book thongs, an ARC, the heroine’s favorite chocolates, are fun, too. Or even the chance to name a character. Remember mailing isn’t free and if you open the contest to outside the US it can get costly. Invite comments. Readers like to interact with you. Ask a follow up question that plays off your post and ask for reader response . . . then go back frequently to answer or leave your own comments. You’ll want to begin the buzz a week before your book is available, then continue through release week and into the next. How many is too many? As many as you can comfortably handle – as long as the sites aren’t all directed to the same core group. You can group all the reviews on one day to make it an event or do one-a-day to make it a progressive tour. It’s up to you. Prepare your content ahead of time so you aren’t overwhelmed. Keep them in a folder along with your photo, covers, bio, etc. so you have easy access. Don’t forget to promote, promote, promote your appearances – on Facebook, on your website and blog, on Twitter, on your loops (if it’s allowed). Encourage friends to post. Make sure you include links and a teaser about what they can expect to find, not just a generic “Check this out…” Posts pull quotes from reviews. And don’t forget to thank your host! It takes them a lot of time and effort to present you to their readers and friends. Make sure you get them the necessary information in a timely manner. Have fun! Be enthusiastic (but not obnoxious – it’s a delicate balance). Establish that connection so bloggers and review sites will invite you back for your next release or when they host special events. And readers will remember your name and look for your book. And your next book. Today at Literal Addiction and Book Monster Reviews I’m interviewing Max and Cee Cee, the main couple from the first four books of my By Moonlight series about their relationship, the storylines, and the new couple in HUNTER OF SHADOWS. I’m offering a unique giveaway on each site! Then, tonight I’ll be chatting from 8 to 10pm EST, and will be revealing some BIG news for the first time, so you’ll want to tune in.